Cobaya Experiment #54 will easily go down as a classic. Quality Meats, the critically acclaimed five month old restaurant on South Beach hosted treated forty gourmet guinea pigs to a QUALITY night. 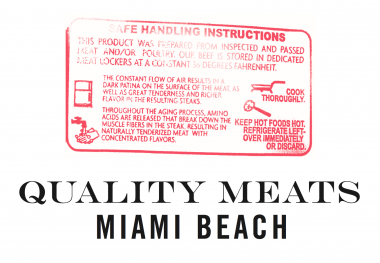 Quality Meats is owned by the father and son team, Alan and Michael Stillman along with Chef/Partner Craig Koketsu. They also own Quality Meats & Quality Italian in Manhattan. It should be noted that Alan Stillman founded Smith & Wollensky and the Stillman's where the original owners of the Smith & Wollensky on South Beach. But Cobaya dinners aren't about restaurants or restaurateurs. They're about Chefs. And Cobaya 54 was all about their talented Executive Chef, Patrick Rebholz. Chef Rebholz is a New Jersey native (bonus points) and a veteran of the Charleston, South Carolina food scene where he spent twelve years. He learned low country cuisine and an appreciation for charcuterie and farm to table cooking while working under the well respected Chef Frank Lee at High Cotton Maverick Bar & Grill. Subsequent to that he became the Chef de Cuisine at the legendary Peninsula Grill. Chef Rebholz is the real deal. He's a talented chef who is full of personality and it carries over into his food. He has a passion for charcuterie and butchery and he used that passion to deliver a knockout Cobaya. This was an all around incredible night. It was fun, creative, exciting and delicious. There was an electric buzz in the room all night. 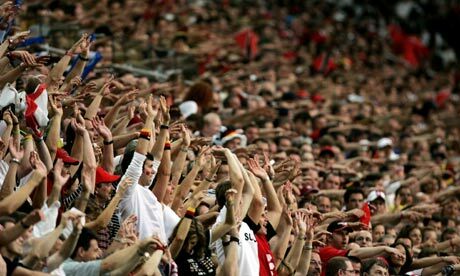 At one point the table of 40 couldn't contain their excitement and spontaneously started to do The Wave. Yes, the wave! A Cobaya first and possibly the first ever at a restaurant. Service was fantastic. The staff was professional and friendly. They had smiles on their faces all night. Obviously the vibe of the dinner was contagious. Sommelier Lewis Starkey paired some wonderful wines with the challenging dishes including a fantastic grower champagne, Jean Lallement Brut Cuvee Reserve Gran Cru. Pastry chef, Cory Colton was in a tough spot but maintained the spirit of the night with an over the top make your own sundae which included towers of tasty quality treats including dessert towers lined with Rice Krispie Treats. Quality chef + Quality restaurant + Quality team + Quality guinea pigs = Quality Cobaya. Huge thanks to Chef Rebholz and the entire crew at Quality Meats for a very special meal and night. And thanks to all of the guinea pigs out there for your continued interest and support. A "warm" welcome as we entered Quality Cobaya. Guinea pigs were treated to a delicious Moscow Mule upon entering our private room. The feast started with a mind blowing Butcher's Roll Charcuterie Board. It featured a dynamite assortment of house made charcuterie paired with some equally fine accompaniments. Coppa with aerated mozzarella, Soppressata with corn bread cream & chipotle maple, Cured Foie Gras Torchon with malted barley & mint mango gastrique, Duck Bacon, Pork Jowl Corn Dogs with tabasco mayo, Calf Liver Mousse with pickled ramps, Suckling Pig Copa de Testa, Merguez "prosciutto" with preserved lemons and Dry Aged Beef Popcorn. Patrick paired the charcuterie with a terrific home brewed pilsner beer. Aerial view of the quality charcuterie. I'll just have the salad... Course two was a refreshing palate cleansing salad consisting of a bounty of vegetables paired with an heirloom tomato granita and sweet corn panna cotta. Next up was Patrick's riff on a reuben. His Reuben Cobia Crudo featured corned beef spice, thousand island dressing, fennel sauerkraut, crispy parsnips, caraway "bread" and a mousse of swiss cheese. Fantastic. Counterbalance - jalapeño jelly and mint watermelon. Great combination of sweet heat. Cleanse - Mango lime sorbet with crispy chicken fat!! Long Bone Short Rib Steak with black garlic bordelaise and silky smooth pommes puree. I'd look out for this if it hits their regular menu. Stimulate - Peaches & Cream piave, juniper shrub with bourbon gelee wanna cotta and streusel. Make your own Sundae with Quality Meats crispy treats. More Sweet Treats. And yes that is a lazy susan lined with Rice Krispie reats. Hot Fudge shot over burnt marshmallow ice cream. Maldon Chocolate Caramels were a fantastic parting gift. Huge thumbs up, way up for a Quality Cobaya.